The Guide provides career and guidance counsellors with a general frame of reference to help delineate all aspects of the assessment and evaluation process and associated issues. The Guide seeks to clarify professional assessment and evaluation practices without specific reference to a particular conceptualization or approach, in order to respect counsellor theoretical choice. The Guide also aims to contribute to the maintenance and development of career and guidance counsellor knowledge and skills within their scope of practice and in relation to the legal foundations of their practice. The Guide deals with career and guidance counsellor assessment practices. 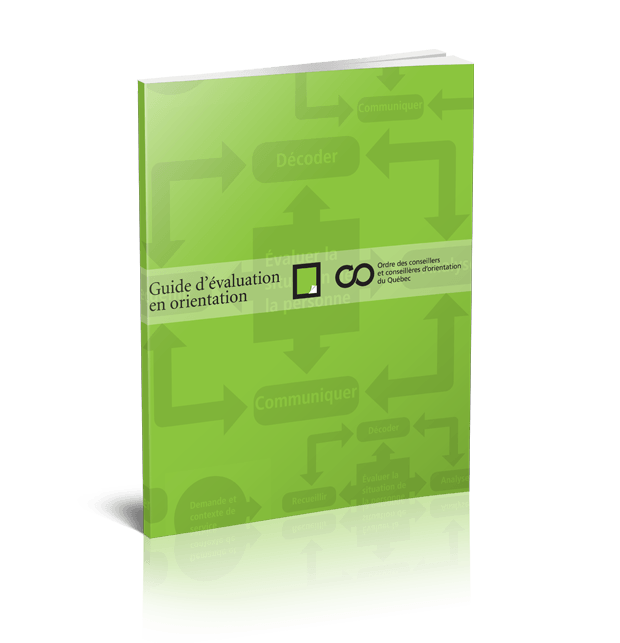 It should not be confused with the interpretation guide for the Loi modifi ant le code des professions et d’autres dispositions législatives dans le domaine de la santé mentale et des relations humaines (An Act to amend the Professional Code and other legislation in the mental health and human relations sectors). This Guide is comprised of four sections. Section 1 addresses assessment as an essential feature of career and guidance counsellor practice. It is specifically concerned with how assessment contributes to professional judgment within a scope of practice, to knowledge and skills, to reserved activities of career and guidance counsellors and to ethical responsibilities. Section 2 defines assessment in regards to three main dimensions of scope of practice: psychological functioning, personal resources, and environmental conditions. Section 3 introduces the process of assessment, which is defined as involving four steps: gathering, decoding, analyzing and communicating information. Finally, Section 4 raises some considerations that allow career and guidance counsellors to better situate themselves in relation to the role of assessment in the context of career and guidance counselling. The OCCOQ is Québec’s professional order (college) of career and guidance counsellors. All practising career and guidance counsellors in the province of Québec must be members of the Order.